There are certain things you take for granted in the suburbs, like garbage pick up, recycling pick up, and your neighbor’s Oak tree not falling on your driveway. That’s because we have expectations, the kind that involve Pop-Tarts, TV, and trees remaining vertical—until a freak October snowstorm smacks down and changes everything faster than a Kardashian marriage. Downed tree branches = downed power lines = downed home temperatures = downed body temperatures = down to grandma’s house in a hurry before you freeze to death. But before you pack up the kids and the dog and head to the home of relatives who haven’t lost power, you must first figure out how to move the 75-foot tall Oak tree blocking your car in the driveway. Your husband surveys the situation with the next door neighbor, which means the two of them stand outside for a long time with their arms folded across their chests, staring at a tree. They come up with a plan, which is to remain standing outside for a long time with their arms folded across their chests and let someone else move the tree. Luckily, your helpful neighbor gets a tree service to come to you before servicing the other half a million people with trees down. The tree service, however, can’t come until tomorrow because the workers are busy clearing fallen trees from their own driveways. So you hunker down for the night with blankets, candles, and books. Even though your kids complain that there’s nothing to do when you’ve lost power, you think it’s kind of nice, especially the “no TV” part. The next day, a crew of workers arrives wielding chainsaws the size of small cars. Within hours they’ve hacked the tree and moved on to the next person waiting to be freed from house arrest. You pack up the kids and the dog and head to grandma and grandpa’s where, upon arrival, the kids are so excited they run with open arms, straight to the TV. This goes on for five days until finally, you arrive home to find a beacon of light streaming from your family room. Your electricity has been restored! You enter your warm home, which is in the exact state you left it in. Your kids follow the beacon of light, which takes them straight to . . . the TV. The TV as the “Beacon of light” is so true. We had a three day Walton’s Mountain event last year without TV and it was a very interesting experiment. Glad your power is now on. Not looking forward to winter after watching your part of the country suffer the past week. “Walton’s Mountain experiment” –I love it! Thanks for your sympathy, and for subscribing! Hilarious!! Cheered me up, especially since we STILL do not have power at our house. Can I come over and watch TV? Oh my gosh, sorry to hear that! Why don’t you make your way over here? Follow the beacon of light . . . Thanks to that oak tree, just think of all the firewood you’ll have to burn if we have another power outage. We were ready to start burning stuff and we don’t even have a fireplace. Glad you found a warm refuge. I hear you–I had a growing pile of laundry I was tempted to burn! 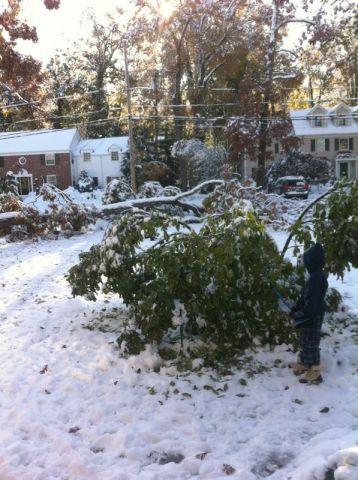 We lost power, trees, patience, warmth and temper while our kids just lost T.V. Love the post. Sorry about the outage. Outta power, outta TV, outta patience, outta beer, – cute story. I’ve heard a number of renditions about the effects of this storm (which hasn’t even been given the dignity of a name), but not one as delightful as yours. Thanks for your comments all–Let’s hope mother nature got it all out of her system for the year. As a Canadian now living in England, I always think I miss snow. And as a former Californian living in New Jersey, I always think I miss the sun. Because I do. I think you just came up with a new idea for reality junk tv . . .